You enter the house through a quiet street (Vicolo) which is truly only two minutes walk from the Piazza del Popolo, the historic center of Todi. 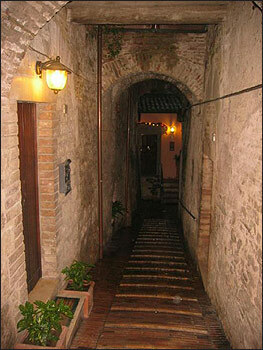 As you turn into the street you will see medieval arches with potted plants in the doorways. Immediately inside the door is the laundry room and stairs to the second floor. © 2006-2014 Vicolo Etrusco. All rights reserved.